Speculative course of the Niger River w/ apocryphal Mountains of Kong. 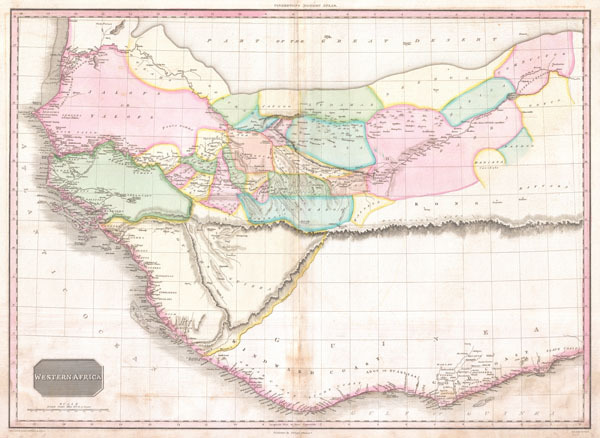 This fascinating hand colored 1818 map by Edinburgh cartographer John Pinkerton depicts Western Africa. Depicts Africa roughly from the Salve Coast and Gold coast west through the Ivory Coast, Guinea, the Gambia and north past Cape Verde as far as Senegal. Including numerous fascinating Tribal references such as the Kingdom of Brak, the residence of the King of Geba or Cabo, the Foulahs of Guinea, and the Maniana Cannibals, among others. Offers interesting inland detail along the Niger River as far east as Timbuktu (Tombuctoo). The continent is bisected by the dramatic and mythical Mountains of Kong, which, based upon the explorations of Mungo Parks, were presumed to be the southern barrier to the Niger River valley. Much of the rest of the continent is blank and as such 'unknown.' Drawn by L. Herbert and engraved by Samuel Neele under the direction of John Pinkerton. This map comes from the scarce American edition of Pinkerton's Modern Atlas, published by Thomas Dobson & Co. of Philadelphia in 1818. Very good condition. Minor discoloration along original centerfold. Minor dampstaining in lower quadrants. Blank on verso. Rumsey 0732.060. Phillips (Atlases) 724. National Maritime Museum, 409.